Moon Tycoon Game Review - Download and Play Free Version! Save the planet Earth by building a successful colony on the Moon! Very helpful tutorial explains the nuances of the game. Niche moon and asteroid locations are unique for simulation games and surprisingly fun. Strategy elements of building efficiently and mining will keep you interested. Campaign scenarios are short and there are only 3. At night the game becomes so dark it becomes hard to navigate and build. It is the year 2021 and the Earth is having a major dilemna. No, it is not a new style of disco on the comeback trail. It is much more serious. The population of the Earth constantly requires huge amounts of energy to keep up with the technological obsessions we so much enjoy. In order to keep up with all of the energy demands, the only feasible solution has been to go to nuclear energy. With all of the nuclear production, there is a huge problem related to the disposal of waste. Scientists conclude that the only solution to this emmense problem is to employ nuclear fusion. Nuclear fusion requires a scare element called Helium 3, most abundantly found on the moon! So here begins your adventure. You will be going to the moon to start mining Helium 3. Mining and building on the moon is more diffficult than on the Earth. There are no trees or supplies to work with and this creates a lot more cost. But, you are the moon Tycoon, so who cares about cost? Just like on Earth, lack of planning for the future was a problem eventually... so it will be with you. Eventually, you are going to have to make money to continue this exciting game. You can start with the obvious, mining of Helium 3. Other options may be to start tourism as a viable industry. Shopping malls, at first will be the only available industry, but if you make the right moves, people will soon be golfing on the moon! 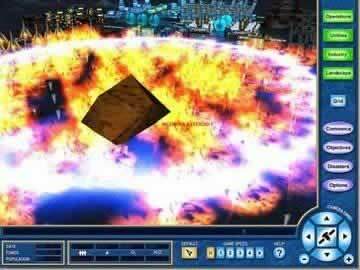 This game is a great play for those who love games such as SimCity. Moon Tycoon is a lunar simulation game that allows you to colonize the moon through building space centers, research facilities, mining, and even a space mall. 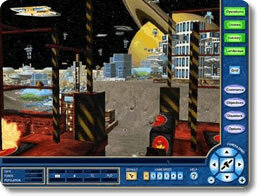 The game is similar to other simulations in its genre, but branches out to create an interesting space themed adventure thousands and thousands of miles from Earth. Through exploring the terrain and researching natural resources, you will learn what your colony has to offer. Using the environment to your advantage and capitalizing on the tourism your colony will certainly draw, are some ways in which you can make this space adventure financially successful and out of this world. Moon Tycoon offers you three options of play. You can begin with a “free play” mode, a “campaign” mode which is a challenge style of play complete with objectives, or you can opt for the “tutorial” mode. This game's unique and complex nature makes it important for first time users to begin with the helpful tutorial. A crucial element of this game that is different from other simulations is your building layout. All of the buildings have to touch or have to be connected with tubes. Since humans cannot occupy space without oxygen, the tubes pump the precious O2 gas through all the buildings. This part of the game is one of the unique elements addressed in the tutorial. If you are inexperienced I would suggest familiarizing yourself with the game through this helpful guide. 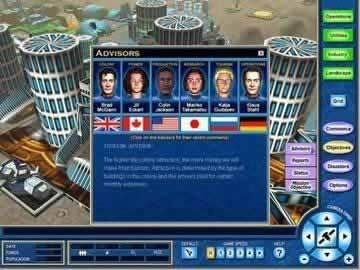 The campaign and free play modes should be relatively familiar to you if you've played other tycoon style games. In the campaign (there are three campaigns) you complete objectives to “move-up” in level. Each additional level brings about increased difficulties and most levels are additions to the previous. For example, if you are to build a space center and two inflatable homes in the first level, the second might consist of you building another center and two more homes with power and water plants. The campaigns are interesting and completing assigned tasks add to the game's intrigue. The free play mode is also great and offers a few fun features. One of these aspects is to build your own scenario. You can choose how much money you want to start with, the type of terrain you want, the length of your service life, the concentration of natural resources, and whether or not you want to colonize the moon or an asteroid. You have the freedom to do whatever you want in this mode and the development of your colony is completely in your hands. The gameplay in Moon Tycoon is relatively simple and easy, with a few annoyances. Once you get the hang of things it won't be too bad, but starting out can be a drag. Trying to place buildings can be tricky and lining up the connector tubes can be hard, especially from some of the weird camera angles you might encounter. Not having clear boarders on the map is also a drawback of the game. You might build right next to the boundary with the intent to continue building, but you will not be allowed to because of the unclear dead end. This might cause you to demolish a building and some tubes and start your project elsewhere. It isn't a major issue, but can still be annoying. Overall, through it's unique environment and modes of play, Moon Tycoon offers a new style of play for games in the simulation genre. The game has a few drawbacks, but its uniqueness and the strategic qualities make Moon Tycoon a game worth trying. Whether you are a space enthusiast, a connoisseur of fine simulation games, or a first time player, you'll go Astro-nuts playing this space themed tycoon game.